IT, ITeS occupiers have taken a big leap in office lease transactions in the last 15 years. Office space demand from them increased from 1.4 million sqft in 2001 to 15.2 million sqft in 2015. With 16.81 mn sqft area transacted in 2016, it translates to a 10% increase (y-o-y). Interestingly, Bengaluru and Hyderabad together recorded more than 50% of this total pan-India IT space take-up. Notably, the transaction sizes are becoming smaller – the average area leased was slightly over 31,200 sqft in 2015, but went lower than 27,000 sqft in 2016. In percentage terms, this is a reduction of 14% (y-o-y) and implies that developers need to be ready for designing business parks for smaller requirements. Their focus should change from quantity to quality of tenants. The number of lease transactions saw a 52% growth (y-o-y), going up from 414 in 2015 to 628 in 2016. Back in 2001, there were only 19 IT leasing transactions. Last year, most of the transactions were recorded in the tech hubs of Bengaluru and Hyderabad (see map below) while micro-markets preferred by IT players across Delhi-NCR, Chennai, Mumbai, and Pune also saw a good number of transactions. The growing transaction numbers indicate that IT companies which previously preferred built-to-suit office complexes increasingly prefer to lease offices which offer flexibility. Earlier, many Indian IT firms, especially the bigger ones like Infosys and TCS, preferred constructing their own campuses. Now, as the client contracts of many of these companies get shorter, they prefer to lease. 1) per sqft per month. The top seven cities in the country have been providing spaces to accommodate this strategy. Industry body NASSCOM forecasts that the IT-BPO sector will account for 10% of India’s GDP by 2020 and create ~30 million direct and indirect jobs. 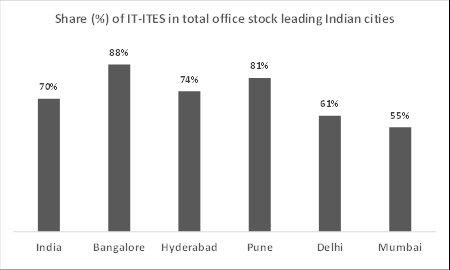 Indian cities are heavily dependent on IT/ITeS for job generation and office space demand. A look at REIS data (see below) shows how much the major cities rely on this key sector to drive job growth, as well as commercial and residential property demand. Last year, however, the pace of growth of top technology firms was in single digits due to global uncertainty and technological disruption. The office space requirements of technology and outsourcing firms – particularly those engaged in software development – also slowed down. There is a fear that leasing by IT companies could plateau out due to clients’ digital transformation, automation, artificial intelligence and protectionism due to a tighter visa regime under the current US government which could force IT firms to tread more cautiously going forward. Hiring could slow down, and more jobs currently offshored to countries like India may return to the US. Another school of thought is that this could lead to an increase in office take-up by these companies as they look to accommodate more employees returning to India. This is also an opportunity for tech companies to scale up efforts in emerging technologies, reskill their teams, become innovative and agile and focus more on translating business needs of clients into software features. Doing so would increase their strategic relevance for their clients. It remains to be seen how the hitherto resilient Indian Infotech sector, which has successfully weathered storms like the Asian currency crisis in 1997, the Dotcom crash in 2001 and the global financial crisis in 2008, will react.